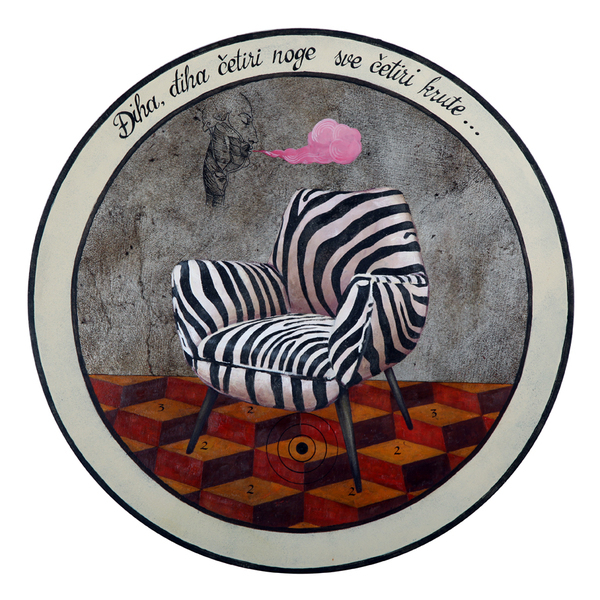 The first time I saw Aleksandar Bezinovic’s works it felt like time traveling, without knowing to which era. His pieces are charged with historical references, playing an anachronistic game on his canvases. 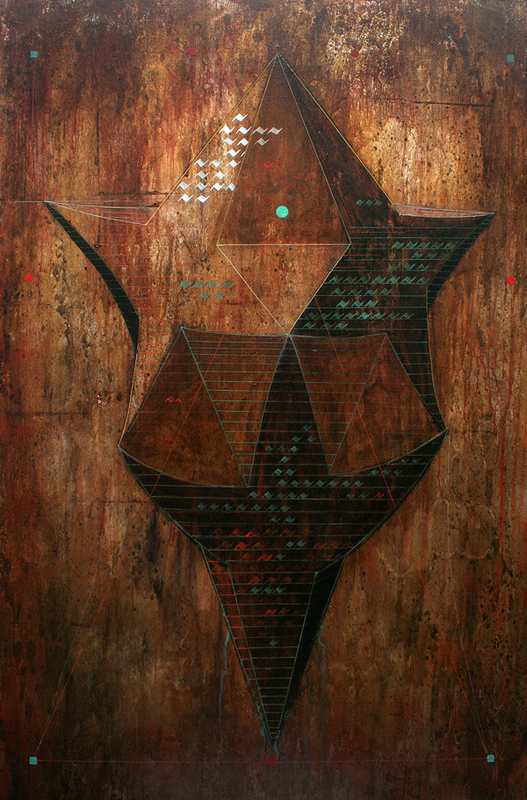 Filled with signs, texts and symbols, his works invite to a deeper observation, revealing quietly provocative mysteries. Born in Croatia, Bezinovic studied Fine Arts and later worked at the Croatian restoration institute as a wood and polychromy conservator for the gothic and baroque period, which contributed to his artistic inspirations. In parallel to this, he started creating and exhibiting his works, with 13 solo shows and over 30 group exhibitions, from Croatia to New York, passing by France and Germany. This year, Bezinovic moved to Dubai, where he co-founded an animation studio, a project born from his whiteboard illustrator experience back home. 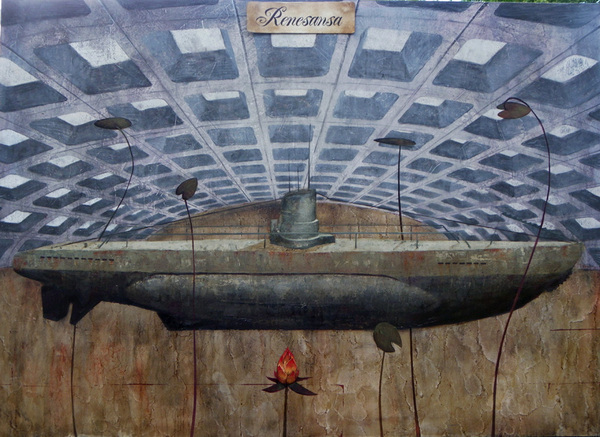 This background has a strong influence on Bezinovic’s work, as his ideas and compositions start with graphic design, to later on be laid on canvas or paper. Pairing his new enterprise with artistic creation, he tells more about the essence of his work. Can you tell me about the media you use, and how you work them, especially the metallic leaves, to give your pieces this "vintage" feel? I love to experiment with different kinds of materials especially if they are not conventionally artistic. Metal leaf is usually connected to trivial and decorative techniques and because of that, it was a special challenge. At first I used them as a reference on early renaissance paintings and iconic representations, but very soon purity of that material became too irritating for me, and destructive forces turned on. I wanted to create expressive backgrounds with specific Yin energy and started applying acrylics, tar, acids, variety of solutions, burning them with fire guns. There are some secrets of the process that I don't want to reveal but I must say that I, unfortunately, permanently destroyed few of very good paintings with fire. I really enjoy this process on the large scale formats. I mostly paint with acrylic colors because it’s faster and gives me more space to experiment after with different materials. Some of the texts appearing on your pieces come from Croatian lullabies. What is the link to your artwork and how did this association begin? Nursery songs and lullabies appear on a series of paintings I created for the exhibition “Croatie la voici” in Paris, celebrating Croatia’s entry into the European Union in 2013. France has launched a festival that specifically focuses on Croatian arts and culture. 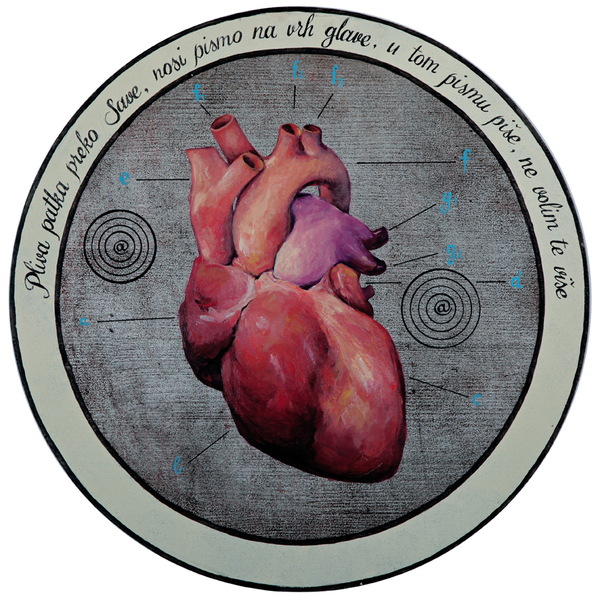 I was featured with three works from this series, all based on a contemporary interpretation of traditional archery painted targets, popular between the 16th and 19th centuries in European archery societies. Because these traditional targets usually had a calligraphic inscription, I decided to use Croatian lullabies on targets to symbolically mark the accession of the youngest member state of EU. In general, I like to write over my paintings and create semantic and contextual turnarounds. What inspired you to create the piece called “Djiha Djiha cetiri noge”? Djiha designates a horse’s mane, and is also used as a call while horseracing. The subject is a child's play with the chair, pretending to ride a stiff legged horse on a long journey. There is a certain irony in using zebra patterns, but I couldn't resist that decorative trophy jewel. Numbers represent target points around a central target, also there to create more mystical tension. You mix styles and elements from different ages, which make your work look timeless. If you had to pick an era, a moment in history other than the present, to create, what would it be? I can’t decide between Early Renaissance and Post World War II New York’s art scene. Probably because both have in common rebirth after crisis, so the great energy and creativity is accumulated. But the postmodern era would also suit me well. In such a different moment in time, how do you think your work would evolve? It is hard to say. From my present experience it depends on a lot of non-artistic circumstances as well. But creating in inspirational movement, surrounding myself with creative and enthusiastic people can only do well. What are your next creative projects and challenges? I'm still a new painter in town and every day I discover advantages and disadvantages of being an expat artist in Dubai. So the biggest challenge for now is to get involved in the local art scene and get the chance to keep developing my work. 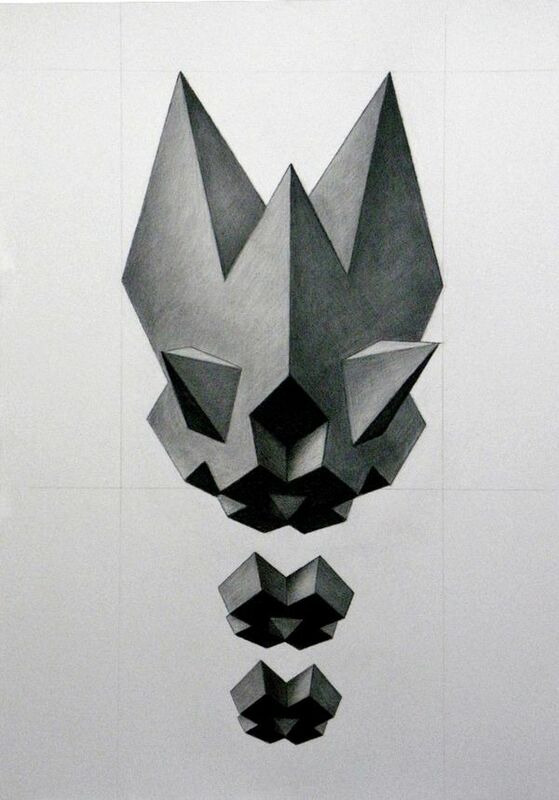 I want to continue with my Polyhedra project and soon start transferring sketches and drawings onto large canvases. I let myself be influenced by local surroundings so geometrical solids that I deconstruct are becoming more organic, gestural, even calligraphic in character. I'm also engaged in an ambitious animation project as an artist and storyboard illustrator and that is the foundation of my stay in Dubai so I wish it goes well as expected.